GIGA SOLAR (used to be the Opto-Electronic Material Div. in GIGASTORAGE) has a strong background in material development. The core technology includes material, organic polymers and chemistry. Ever since 2006, we have been participating in the project led by Ministry of Economic Affairs to develop conductive paste for PV cells. After the verification by domestic top manufacturers of PV cells, we started mass production and kept making improvement. So far the products of conductive paste including rear Al, rear Ag and front Ag have reached maturity and been sold all over the world such as Asia, European and American markets and consequently our company increases the name recognition as well as the market share. 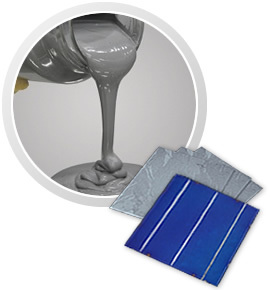 The core value of our PV conductive paste lies in the customized design of material formula. The technology includes organic chemistry, inorganic materials, mechatronic science, fine-line printing, high temperature sintering, chemical reaction and etc. We will focus on the R&D of manufacturing process regarding the thinning of thin-film-base PV cells, low warp, high adhesive force, lead free and etc. Since our products demonstrate outstanding performance and can help increase the conversion efficiency, they have been adopted by top manufacturers at home and abroad. As for our future R&D direction, aside from the improvement in several properties such as thinning & high electrical conductivity of the current products to reinforce the paste for PV cells, we would develop some special materials for paste vertically and materials for the energy-saving industry horizontally. While at the same time we will dedicate ourselves to the development of solar power stations at home and abroad. Since the power station has stable economic scale with fixed return on investment every year, we would make a thorough connection of the upstream/downstream PV industry. Our unique business approach “design of material formula” and “service of integrating the manufacturing process” can help us customize the design-in material, serve customers’ needs promptly, and even work on the downstream product-testing equipment to provide an integrated service for the whole manufacturing process. With the consistent goal between the executive team and all the employees, we will keep making every effort to produce an utmost profit as well as corporate value for all the shareholders.